The Working Stiffs are enjoying the holiday weekend. Memorial Day, originally called Decoration Day, is a day of remembrance for those who have died in our nation's service. Let's not forget the men and women who fight for our freedom. I used to be that girl: the one who played her favorite single over and over for days on end, annoying everyone else in the household and some summers, the entire neighborhood (no air conditioning = heat = open windows, much to the dismay of the neighbors). Also, I tended to keep the volume a little higher than necessary. I drove with my windows down, singing along to the pop tunes playing on the radio. I was often spotted by a friend stopped at a red light immersed in a song, oblivious to my friend’s attempts to get my attention. So it’s somewhat a mystery to me how somewhere along the way I quit listening to music while I drove. Instead I started listening to books on CD in the car. At this point, you’re probably wondering where I’m going with this. . .
My daughter is an “official gleek” -- a follower of the new TV show “Glee.” She has every “Glee” CD and DVD and listens/watches them constantly. Now that she’s home from college, it seems that I must also be a “gleek.” I’m surrounded by the music of “Glee” (she seems to take after me in obsessing over her favorite songs…unfortunately). From my second-hand exposure to “Glee,” I’ve learned what’s so great about it. All the songs that made music so great back when I was growing up are being remade by “Glee”: “Dream On” by Aerosmith, “Imagine” by John Lennon, “Proud Mary” by Tina Turner, “One Less Bell to Answer” by The 5th Dimension, “Don’t Stop Believing” by Journey, “Beth” by Kiss, and the list continues. Not only that, but I’m discovering all the recent music I’ve been missing, listening to books on CD rather than the radio in the car. This past episode exposed me to Lady Gaga and her music. Any other “gleeks” out there? Why is it that when it's my turn to blog, I can't think of anything interesting to write about? I have plenty of ideas for fiction projects. Blog posts? Not so much. So I'm going to bore everyone to death and talk about yard work. We've been doing a lot of yard work over the past few weeks. (Hubby really started in March--he drastically pruned an overgrown maple tree, rebuilt a retaining wall, and re-seeded two areas of lawn.) We had three tons of rocks delivered and hubby built a stone wall at the top of the hill in the backyard. It's like a small version of the walls they have all over the Gettysburg battlefield. I should be fair and say that my contribution to the wall building was bringing hubby an occasional glass of water or an ice cold beer. The rocks were too heavy for me. Two days later, we had seven yards of shredded bark mulch delivered and dumped at the bottom of the driveway. In case you don't know, a yard is 27 cubic feet. One yard will fill approximately nine wheelbarrows. Seven yards is a pile about five feet high and about ten to twelve feet in diameter. It's big. We have a lot of beds to mulch, and they look really nice now. Needless to say, I'm not getting much writing done. The good news is the yard is almost in shape with plenty of time to sit and enjoy it. I was all set to write about my weekend away from civilization when I spotted Joyce’s post yesterday. Since my weekend can be summed up in a few words (It rained. I edited. ), I decided to dig up an old post of mine about the recently solved murder and several other similar ones that had a huge impact on me. It may be a re-run, but I figure it’s old enough that many of you may have missed it. Or forgotten. So while I keep working on my edits, I leave you with this. We don't have a scheduled blogger today, but here's a link to an interesting article. I am grappling with language. Following an appointment at the Pennwriters Conference, an agent actually requested a full manuscript of one of my novels! He asked for an electronic copy, so of course there was an initial data corruption crisis that terminally screwed up almost half the manuscript. A desperate trip to Fed Ex/Kinko's at 7:45 Sunday morning resolved that -- I think. My most recent hard copy of that section (136 pages) has been scanned and converted to Word. Now I just have to go through and correct the scanning errors and try to remember the few (THANK GOD) revisions I've made since that copy was printed. The really difficult part, though, is resisting the urge to do a total rewrite. This is particularly problematic because the novel is set in 1970 and I find myself second guessing my use of language. I want the dialogue to seem authentic to the era, without sounding either silly or incomprehensible. I thought I had that down, but now I'm wondering. Maybe this insecurity stems in part from my recent reading of Kathryn Miller Haines' latest, When Winter Returns. KMH has that WWII language down perfectly. If I didn't know better, I'd think early Archie Goodwin was speaking, it sounds so authentic. This is particularly impressive because I know KMH -- she is no way old enough to have been around during the early 1940s! I, on the other hand, lived through the 70s, so there is no excuse if I can't remember when we started saying "wasted" to mean "killed." It could be worse, I think. Authors who set works in the Elizabethan era find themselves in a damned-if-you-do, damned-if-you-don't conundrum. Any term more modern than the 1600s is certain to be challenged by picky readers, but who really wants to plow through a novel that uses only the language of Shakespeare? So I've pulled out my old Doors tapes and tried to slip back into a psychedelic frame of mind. Scroll down to the end of each link to see what happened to the foolish Ms. Townsend. In the past two months, I've seen the inside of the county jail, holding cells in four police stations, the district courthouse and a police cruiser. I've become familiar with TASERS, traffic radar, illegal narcotics, SWAT teams and K-9 dogs. I've had a taste of what it's like to be so drunk you can't walk in a straight line (sobriety goggles), along with the adrenaline rush and fear of facing someone who might want to kill you (shooting simulator). I've learned everyone knows a victim of domestic violence, that being a judge can be extremely difficult work, and only a select few men and women survive the arduous process of becoming a police officer -- and once they do, they undergo extensive training to learn how to do their jobs even better. 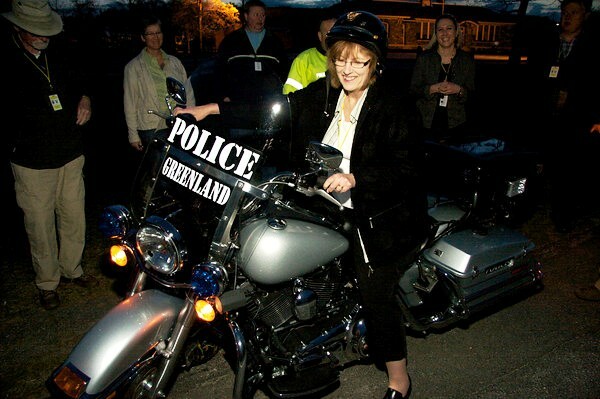 But now the Citizen Police Academy is over and I'm sorry to see it end. It's been an eye-opening experience with fascinating, behind-the-scenes access to law enforcement. I hope it's making me a better crime writer. I'm certain it's made me a better citizen and I know it's given me a better understanding of my son's new life as a policeman. The CPA also showed me how much I didn't know about police work -- which is why I'd highly recommend this type of experience for anyone who writes about crime but has never worked in law enforcement. It's a great way to add realism to your writing. When I look back on the past eight weeks, a couple of things strike me. One is the amount of latitude police officers have in their job. Other than cases of domestic violence, which require an automatic arrest in my state, there are many areas of law enforcement where a police officer is expected to use his or her judgment. For example, last year police officers in my community made 9,544 motor vehicle stops -- but wrote only 1,387 traffic citations. The officers say they make these stops to try to keep everyone safe, not because they like writing tickets. If you knew my driving record you'd understand why I might have been a little skeptical about this point prior to the CPA. Police officers also belong to one of the few professions where decisions can have life or death -- and often life-altering -- repercussions. Their lives are at risk every day they show up for work. These men and women who are so well-trained to keep us and themselves safe would tell you two common police activities are considered the most dangerous: motor vehicle stops and domestic disturbance calls. That's because they have no idea how the subjects involved will react -- or what weapons they're willing to use. It was chilling to watch the police officer during my ride-along touch the rear of each car he stopped to leave his fingerprints as proof he was there in case something went terribly wrong. I have concluded that being a police officer requires great courage. Not only in facing down the bad guys or risking their lives to save the rest of us, but also because they encounter people at the worst moments of their lives. Police officers see things we never want to. They also spend most of their time dealing with people who are uncooperative or combative -- far from your average law-abiding citizens. That has to grind you down after a while. So much of what a police officer does on a daily basis never ends up in the public view and some of it involves things most of us would rather not know about. I think it's important to remember when we create our police characters that those who choose law enforcement as their profession are far more complex -- and brave -- than most people realize. We at least owe them that. As the official conference photographer, Annette took some fantastic shots. Go check out her blog to see some of them. http://annettedashofy.blogspot.com/ She sent me the following photos so I could upload them today. Thanks, Annette! Earlier in the evening, I had begged agent Janet Reid to attend the party. Awesome person that she is, it didn't take much begging. Janet likes to make people think she's mean and tough, but a lot of us know better. By the time Janet popped in, I'd been in that costume for about 15 minutes. Warm and stuffy. She showed up, I got the laugh I wanted. I couldn't wait to get out the costume. 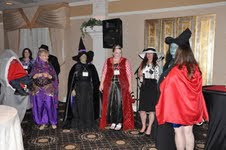 Then someone dared me to traipse through the hotel lobby in my costume. Since I would've been the kid to stick my tongue on a frozen pole, I was off in a flash. Of course, there were two long hallways to go down before reaching the lobby. With parties and people everywhere. I found friends in the lobby (and made some new ones along the way), and all I remember is the flash of lots of cameras. And shouting. And laughing. I loved every single minute of it. I live to make people laugh. bench. See the hat Annette is wearing? True friend that she is, she tossed it on my head to hide my sopping wet hair. I stuffed the shark in a bag and we returned to the party. Someone offered to buy me a drink if I would crash the prom going on in the courtyard. That's all it took. The shark came out of the bag. Back down the long hallways, through the immense lobby, past the other parties. Loud, very loud rap music was playing when I strutted into the courtyard. Giggles, laughter, high fives all around. There are no photos of this because Annette said she was laughing too hard. The shark went back into the bag and I gulped down my drink. I went outside for some fresh air and met a woman who said she'd heard about someone dressed up like a shark. I admitted to the deed. She begged me to show it to her and her friend in the bar. Back to the party where I pulled the shark out of the bag, walked down the halls, through the lobby and into the bar. Laughter, yadda yadda yadda. I shoved the shark into the bag, went back outside for some more fresh air. After cooling off, and with my hair fairly dry, I returned to the party. I was told I was in the running for Best Costume. Or Funniest. Or Original. I offered to put the costume back on. Five of us stood at the front of the room with the party hostess. Ayleen Stellhorn, conference coordinator, was appropriately dressed as Wonder Woman. Here I'm being asked "Who are you?" My answer, "Victim of the Query Shark." Winners were chosen by the volume of the audience's applause. My turn came and the response was overwhelming. The thunderous applause and cheers made up for all the overheating, stuffiness, and sweat. Would I do it again? Only if someone double-dogged-dared me. Who am I kidding? I'd do it again in a heartbeat. *I already did this in person, but a very special thanks to Ayleen for letting me crash her conference. I’m excited to write my debut post for Working Stiffs. Thanks to Annette for inviting me. 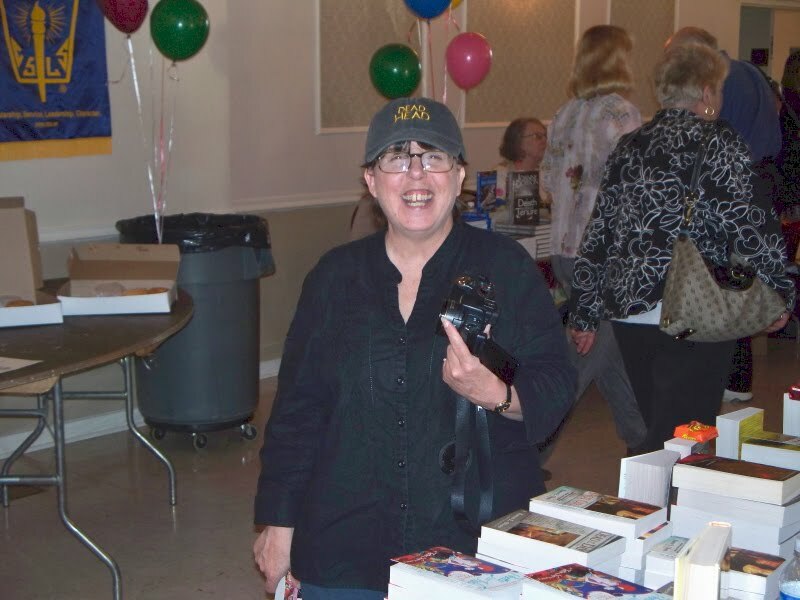 After attending the PennWriters conference this weekend, I began thinking about how my work has progressed in the last year. I started writing THESE WALLS CAN TALK, a YA paranormal novel in January 2009. Four months later, I pitched it at the PennWriters Conference in Pittsburgh. The book’s about a 17-year-old ghost hunter named Leia who learns she has a psychic ability known as retrocognition. She can step into rooms and see the history that occurred there, including secrets some would kill to keep hidden. A few agents at PennWriters requested pages. Two weeks later, I attended the Backspace Conference in New York City. Other agents requested pages. I thought I was golden. But then I learned an interesting concept does not equal book sold. Those pages the agents request really matter. Here’s the thing I’ve learned: writers query and submit pages way too early. I’m guilty of it. I’ve heard agents chirp about other writers who commit the writing crime. Let me offer a concession here. Sometimes agents do take on work that isn’t quite ready with the promise the author will work with said agent to revise, revise, revise. However, it’s not common because many agents lack the time for such efforts. I remember the weeks it took to write THESE WALLS CAN TALK. Yes, it took four weeks, which should be the first clue significant revisions were necessary. I write fast, but the manuscript didn’t honor every element of good novel-writing. The scenes did not link in a cause and effect manner. Some scenes didn’t advance the plot at all (thank you to Nathan Bransford for pointing that out to me so graciously). The characters weren’t always true to themselves and at times behaved rather wishy-washy. In other words, it wasn’t ready. But I had worked on it for months. I had done everything I could. It HAD to be READY. The problem was I didn’t know how to fix what I had created. So, I read books on writing, took several online writing classes through PennWriters, participated in workshops and critiques with the Sisters in Crime, and found a really good critique partner. The knowledge I collected from these sources served as a translator, clarifying the comments many agents had offered me along the way. Sparks of revision ideas soon followed those “Aha” moments. I kept a notebook with me at all times, and when I thought of a way to better connect scenes or to show character traits more consistently, I wrote it in the notebook. The notebook is now filled with page after page of scribbles that will make the story better. I wanted the book to be as good as it could be when I submitted it to agents a year ago, but I didn’t have the experience and knowledge to identify the mistakes I was making. That’s the difference a year makes. I can only imagine the tips and skills I’ll pick up in this next year. If there’s one lesson I’ve learned over all others, it’s DO NOT SUBMIT UNTIL YOUR MANUSCRIPT IS ABSOLUTELY READY. There’s no rush. I know electronic publishing has created a major debate regarding the disappearance of traditional books, but publishing really isn’t going anywhere. Agents want to see the best work you can present to them. If that takes a month, or two, or six, that’s fine. Yeah, you’re making them wait. Not the best scenario. But think of the alternative. You have this great opportunity – an agent interested in your concept – but the pages aren’t ready, and instead of an opportunity for when they are ready, you end up with a rejection and a manuscript crying out for revision. Instead, let your work rest before rushing to send it. Search for a few beta readers. Offer to exchange a critique with another writer nearing submission. You’ll learn as much from identifying what works and doesn’t in that writer’s manuscript as you will from the comments he or she provides you. Sign up for an online writing class and as you learn, evaluate your manuscript. Is it excellent on all levels? Pick up a writing book like Story by Robert McKee, How to Write a Breakout Novel or Fire in Fiction by Donald Maass, or any others that look appealing to you. Read them actively. Complete the exercises. Do your scenes, characters, plotlines, twists, and all other tidbits in your book still classify as excellent? If so, go ahead and send that manuscript off to the agent(s) who requested it. If not, writing is rewriting. So, time to come clean. Have you ever queried or submitted pages to agents or editors too early? How did it work out? I returned from the PennWriters convention on Sunday and let me mention up front that if you are a writer and do not belong to the PennWriters organization you are doing yourself a grave disservice. I can’t say it any plainer than that. I have been a member for 3 years and I wish I had joined a decade ago when I first started. It would have saved me years of struggling, individual effort! The annual convention was hosted at the Eden Resort in Lancaster, PA which oddly enough seemed like a long way off on the way there and significantly closer on the turnpike ride home. The resort is a very nice complex and even though we shared the facility with a wedding and a PROM and evidently a gospel meeting judging from the singing going on there was plenty of room for everyone. 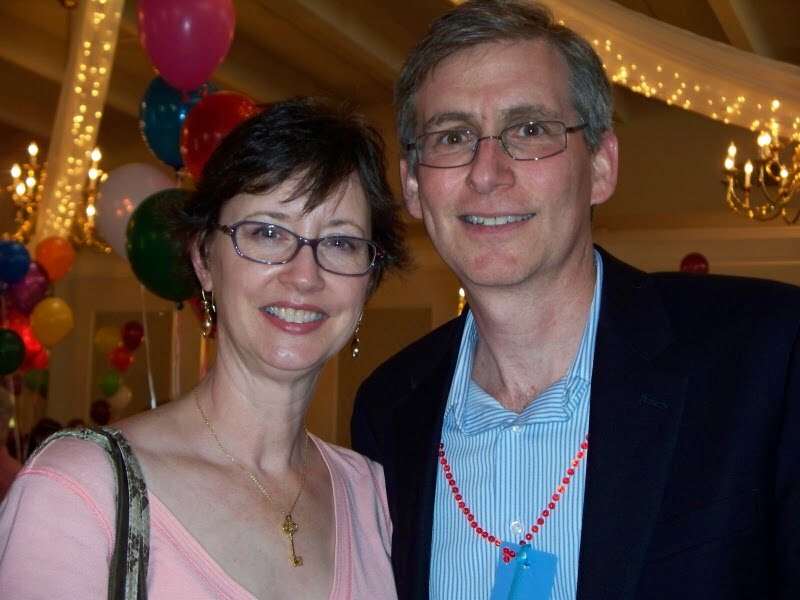 Ramona Long and I hung out in the lobby as the prom court went by and I know I was never, ever that young. 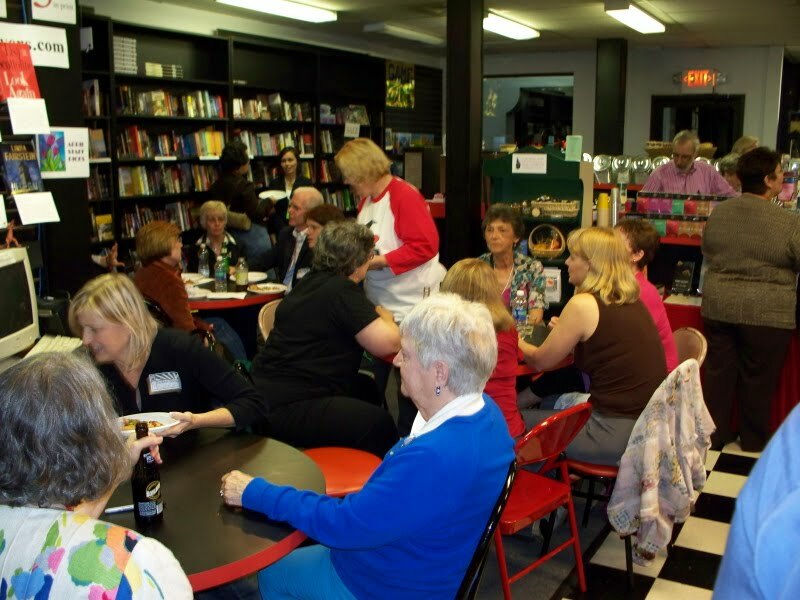 I'm really very proud of the way our Sisters in Crime/PennWriters group has developed and grown and I know we must be doing something right because every time we sit down we have to add tables and chairs for interested newcomers. That was another great thing about the conference: the chance to talk for hours about nothing but the craft of writing and the easiest way to start a conversation was to ask a stranger: what are you working on? It's going to take me a week to catch up on my sleep because this weekend was like going to Vegas - I stayed up way too late and couldn't close my eyes because there was always something fun to watch and/or going on. I can't wait for 2011 - and the conference is back in Pittsburgh! Mark your calendars now. Sorry to be a disappointment on a Monday morning, but life and my day job have taken over my life. I may have mentioned it before, but my baby girl, Kaitlin Michelle is days away from graduation from high school. Today was spent power washing the siding on the house getting ready for the graduation party. Wrestling with the power washer was like going 15 rounds with an octopus. Then there were the multiple ups and downs on the 32 foot ladder. I could barely lift my laptop to write this. Then there is the wedding that is fast approaching. My oldest daughter is getting married on July 10th. I think every weekend between then and now is booked. Last night I got about 3 hours sleep. Not sure if it was the decongestant or the problems I'm having revising my website, or all the other stuff running through my mind. But I did actually wake up with the tag line below on my mind, so I got up and wrote it down at 2:30 AM. I would up going back into the bedroom at 5:30 AM. My website. It's been a while since I revised it. Problem is, the laptop with all my files and the FTP setup crashed. I replaced it with my MacBook Pro, which is totally not compatible with the files. I spent Saturday night developing a new site on iWeb. It came out okay, but I have lots of cleanup work to do. Check it out if you'd like. On top of all that, I am headed to Orlando this week for my day job to give, not one, but seven presentations in a two day period. At our company, this is the big conference of the year and presentations have to be spot on with content and presented flawlessly. I've given 5 dry runs in the past week. With 3 days left before the presentation, and days of time that I couldn't afford to spend putting it together, this week will be busy. Some temptations really are, to die for. SINFULLY DELICIOUS coming soon from Echelon Press. Well, I hope you all have a less frenzied week than I. I'll try to check in a few times. I'm assuming that if you're reading this blog chances are you're also a reader of novels. I'm wondering if you had to pick a fictional character's life to trade places with, whose life would you choose and why? The operative word here is "had." I know that most of us, myself included, wouldn't trade our own lives for another's, fictional or otherwise, but playing along with me, let's assume you had to. Who would you like to be? My answer is, without a moment's hesitation, Sara Paretsky's, "V.I. Warshawski." It's not unusual after reading a V.I. Warshawski novel that I might catch myself humming, "I Am Woman" by Helen Reddy, while outside mowing the lawn (I don't want to date myself so let's just say I was very, very young when that song first came out). V.I. just has that effect on me. I'm attending the Pennwriters Conference today and might not have the opportunity to check back in until later in the day, but I'm looking forward to reading your comments. I'm off to the Pennwriter's Conference today. Instead of a post, I'm leaving yinz guys to play nicely among yourselves. In the comments, tell everyone your conference stories. What was the best conference you attended? The worst? What was the greatest thing that happened at a conference? The funniest thing? The worst thing? Come on. I know you have some good ones! As you read this, I’m either in the process of heading out the door or on the road to Lancaster and the Pennwriters Conference. It’s finally here. Last year, I coordinated the conference. That means I didn’t get to participate in any of the workshops. Okay, I did steal away for the Crime Fiction Panel, but that was it. I attended the dinners and luncheons, but was too anxious to really enjoy the food. This year will be different. (I hope!) In way of “payment” for all the work I did last year, THIS year’s conference is pretty much comped for me. Good thing, since Hubby is still unemployed…and seeming to like it. Ahhh, but that’s a topic for another day. The point is I plan to have a helluva good time this weekend. I admit I’m stressing out over my agent pitch. But since my appointment is scheduled for 10:40AM Friday, I’ll get it over with and be free to kick back. After last year, I swore I would never be intimidated by an agent again. And really, I’m not. It’s not the agent that has me stressed. It’s the whole “sending my baby out into the world” thing. I don’t care if it’s a novel, a short story, a magazine article, or a 250 word column, there is always a little fear about opening up your heart and soul to the public. And this is the first pitch/query I’ve done for this particular manuscript. It’s as though this is my baby’s first day of school. I’m the nervous mother. And I so want someone to like my child and befriend her. Yes, I’m getting sappy. Sorry. By Friday, I promise to be totally professional. Anyhow, I’m looking forward to the array of workshops and events on the schedule. There’s Tim Esaias’ day-long workshop tomorrow; Ramona Long’s Mystery Writing Breakout session; CJ Lyons’ Pitch Perfect and No Rules, Just Write workshops; and Loree Lough’s Synopsis class, to name a few. 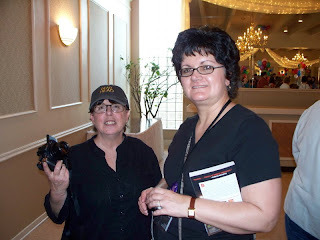 I’m also looking forward to socializing with friends that I only see once a year, as well as my local Sisters in Crime and Pennwriters who are traveling across the state today or tomorrow. There are a lot of folks I wanted to spend time with last year, but I was too busy, and they were gracious enough to give me rain checks, which I intend to cash in. So I’m outta here. I’ll see some of you there. Good luck to everyone who’s pitching. The rest of you can talk among yourselves today. I’ll be posting progress reports and photos of the weekend over at Writing, etc. Feel free to stop in. Oh, by the way, next week you’ll have the pleasure of meeting our newest Working Stiff, my friend Tamara Girardi. She’ll be alternating Wednesdays with me. Make sure you check in and give her a warm Working Stiffs welcome. On the first day of the Citizen Police Academy, each of us was handed a card with an indistinguishable black and white photo on it. We were told to keep looking at it until the subject became clear. First one, then another of my classmates raised their hands. It wasn't long before nearly everyone else but me figured out what was in the photo. Finally, someone took pity and told me what I was supposed to see in the optical illusion -- the head of a cow. Of course. It seems so obvious now. Can you see it? The police officers were trying to make the point that things aren't always what they seem -- and if you look at them from a different perspective, you may see something totally different from what you initially thought. Very important to remember in police work (and in mystery fiction). Then the Police Chief said, "It's like that arrow in FedEx -- once you see it, you always will." I had no idea what he was talking about, but for weeks I stared at the FedEx delivery trucks parked outside the FedEx/Kinko's next to my gym. I've walked around them and looked from every angle. I still couldn't see it, but I figured the Police Chief wasn't lying. So I kept looking. And then finally last week, there it was -- clear as day. How could I have missed it? Can you see it now, too, thanks to the beige coloring on the arrow? It made me think of my husband's favorite sayings -- "Perspective: Use it or lose it." I try to remember these words of wisdom when it IS important to see the forest for the trees -- whether it be in my writing life or my personal life. Do you find that sometimes stepping away from things, changing the perspective -- and your perception -- can help when you're stymied with your writing? That may mean taking a walk, putting your WIP aside for a few days, or having someone else take a look at it, for example. Another kind of perspective I've been thinking about a lot recently is how sometimes our problems don't seem so huge when compared to what what others are experiencing. I think about my friend maintaining a vigil by her husband's side since mid-March when he became critically ill, and nearly died, the day after their daughter's destination wedding in Jamaica. I think about the girl a family law judge told our Citizen Police Academy about -- sexually molested by three different men: her father, then her stepfather and finally his brother -- all before she turned 15. Or the woman who told the same judge she couldn't go looking for work until she could afford to buy a pair of shoes. Perspective: Use it or lose it. I think I'll "use" it. How about you? 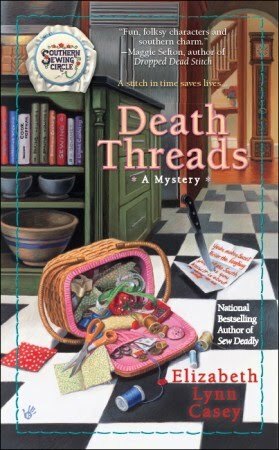 Looking back to our early influences in the mystery genre, most of us mention Nancy Drew and the Hardy Boys. Who can forget Nancy tooling around with George in her roadster, following clues that often led her into danger? Or Frank and Joe working together to find the murderer? Then I remember Perry. Gardner wrote more than 80 Perry Mason books. The tv show ran for years in its original form, then came back in color with an older Raymond Burr. The astonishing thing about this is that there was essentially only one plot: Perry exonerates a client charged with murder by determining who really killed the victim. A large part of every episode took place in the court room, where Perry's incisively cross-examination of the witness he had determined to be the killer almost always resulted in a confession. I've been rewatching some of those early episodes, courtesy of Netflix, trying to figure out what makes them so appealing, even after all these years. Variety came through the clients themselves, who ranged from elderly miners to shapely fan dancers, and the details of their particular situations, but the interaction between the regular characters also helps to hold interest, despite the fact that there is little development over the years. We never learn much about Della's backstory, or Paul's. They are stereotypes - the faithful secretary, the dogged detective, filling their niches. Maybe that's the key. We really don't have to find a new and different plot or unusual characters. We can rewrite the same tired story time and time again, using the same stock characters and, with a few minor tweaks, make it work. Last time I invited a guest blogger here, she wrote about writing lessons she'd learned from her dogs. Today I invited someone else, and she's giving me chickens and eggs. I see a trend; what about you? Anyhow, we've got a guest today. Put your hands together for my fellow Berkley Babe and Good Girl - and good buddy of our own Wilfred Bereswill's - Laura Bradford AKA Elizabeth Lynn Casey, who's here to talk to us about fowl. It’s a question that’s been pondered for generations. Heck, it may even have been posed in the form of pictures back in cave days. Yet here we are still scratching our heads and wondering when the answer may finally be revealed. While I’d like to say I’ve come forth to finally settle the debate, I can’t. I’ve simply come to muddy the waters a bit more (I’m helpful that way). Thirty years ago, the writing bug bit me. And by bit, I mean B-I-T. Hard. Only back then I preferred children’s books as it gave me a good excuse for writing off my annual 64-count box of Crayola Crayons. Somewhere along the line, I switched to mysteries. Adult mysteries. Which sort of implies the chicken came first, don’t you think? After all, I’d been an avid fan of Mary Higgins Clark for years and her work certainly propelled me toward that genre. A. I’m working in a very small stock room at Borders Books and Music in St. Peters, Missouri a few years ago. My task was to bring some semblance of order to the massive calendar shipment we’d received in preparation for the mall kiosk. What did I do? I looked up at the drop ceiling above me…very, very, veerrryyy slowly, certain that someone had stuffed a body in the ceiling tiles above my head. A. I’m leaving the Malice Domestic conference this past weekend with my trusty Mapquest directions in tow. They’ve yet to steer me wrong and so I trust them completely. Now, while I’d like to say they’re the reason I ended up in Georgetown instead of where I was trying to go, I can’t. The fault was all mine. Either way, though, I found myself pressing the little On-Star button on my ceiling and utilizing my free trial turn-by-turn (GPS help). The second the operator turned the directions over to the automated system and I heard the voice telling me where to go…and watched its written directions work their way across my radio screen…I started plotting. Which leads me back to the original question but with a slight twist. Was the mystery writer in me there all along or is it something I chose to seek? I don’t know about you, but the Egg theory is looking mighty good right about now. Elizabeth Lynn Casey is the national best-selling author of the Southern Sewing Circle Mystery Series with Berkley Prime Crime. SEW DEADLY, the first book in the series, debuted in August. DEATH THREADS released this week. 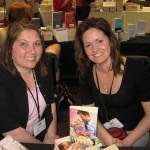 When she’s not writing mysteries, she’s tinkering around in the world of romance under her real name, Laura Bradford. For more information, visit her websites: http://www.elizabethlynncasey.com/ and http://www.laurabradford.com/. Everything that Annette said yesterday? Yeah. This event, sponsored by Mystery Lovers Bookshop in Oakmont, PA, is worth the four hour drive. I had a plan ahead of time, and knew exactly what books I'd buy and I'd stick to my budget. I was grateful for Hank Phillippi Ryan's generosity -- again -- when she gave me a gorgeous tote bag. I've no idea why, but I hadn't gotten around to reading Hank' s books. I know! Can you imagine? When I bought her first three books, she gave me the tote bag. Big enough for all of my books. I spent more than I'd planned because I met a lot of authors. Some I'd never read before; some I buy their books as soon as they come out. Speaking of which, the hat I'm wearing is from another generous author -- Rosemary Harris. I bought her latest, Dead Head, and she sent me the hat. Cool, huh? A good time had by all according to these photos. I'm already looking forward to next year. Thanks so much Mary Alice and Richard! Monday was the annual Festival of Mystery in Oakmont. It was tons of fun, as always. I mean, what’s not to love. A room crowded with book groupies…MYSTERY book groupies at that! It just doesn’t get much better. Except when my dear friend and fellow Working Stiff Paula Matter puts in a surprise appearance. She had her husband’s camera and was snapping away, so check back tomorrow for PART TWO of the report from the festival. The Festival doors open promptly at 4PM. I happened to be hanging out with some of my Sisters in Crime way too close to the entrance and was nearly trampled. Thankfully, we were given just enough warning and managed to duck out of the way. Here’s a shot of our own Martha Reed (she of the recently finished manuscript…GO GIRL!) chatting up Nancy Martin. 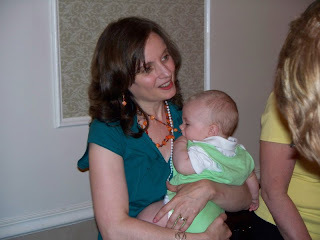 And here’s lovely new mom Kathryn Miller Haines with her beautiful boy. Paula again, this time with fellow Stiff, Joyce Tremel. Then Paula snapped this one of me with Alan Orloff. Seems like we’ve known each other for ages online, but this was the first time we met in person. That’s one of the things that’s so great about the Festival. Two other things are Richard and Mary Alice of Mystery Lovers Bookshop, which is where we all descended for the After Festival Pizza Party. Either the pizza was super yummy or I was super hungry. Or both. Can’t wait until next year. Mystery Lovers Bookshop and the Festival of Mystery ROCK! I’ve been working steadily on my manuscript, keeping my eye on the prize, an agent pitch session next week at the PennWriters Conference in Lancaster, PA. Getting a book published is so much harder and so much more work than just crafting a story – there are all these supplemental documents you need to create: the perfect pitch, a synopsis, an enticing query letter and an outline. But all these support documents need to be in place on the off chance that lightening might strike and you might actually need them. But first and foremost, and what you read about all the time, is that you need to have completed your manuscript. Not an outline; not the tentative first 100 pages; the whole damn thing from soup to nuts. And I’m happy to report that I have. Of course, it was a little odd to cruise into Chapter 30 and suddenly realize that I was two pages away from finishing my novel, mostly because I’ve been so dedicated to it and working on it for so long that to be faced suddenly with an ending came as a bit of a surprise. I paused and took a look at my text and agreed that yes, this was the ending and here I was, done. (You probably have to be an old slag typesetter to know what that symbol means but I was one so I can use it). The wacky thing is that within the next ten minutes I was already casting ahead for the next outline. You would think that with all this tremendous effort behind me I would want to take a break, but no, I find the opposite is true. Sure, I still need to edit this one but I’m already anticipating getting started on the next. Talk about being overwhelmed. 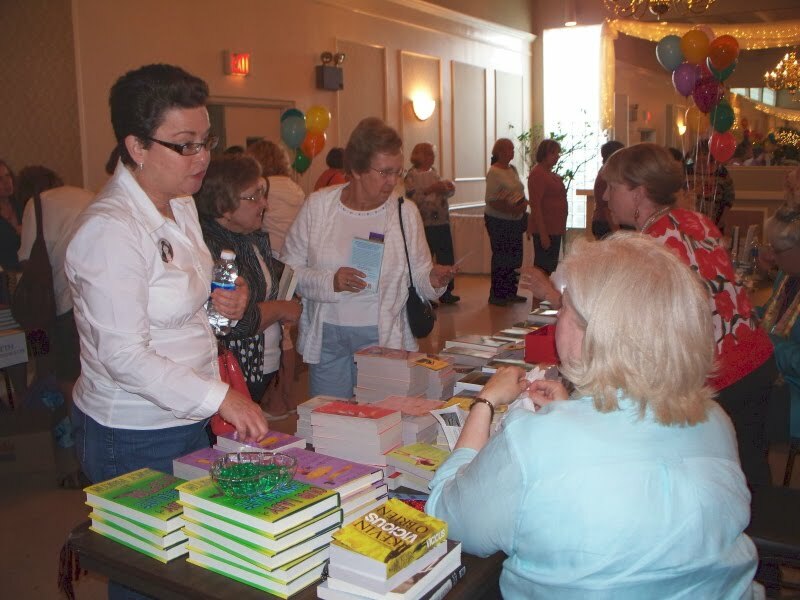 This weekend was the Greater St. Louis Book Fair. It's held annually to benefit a number of charities in the area. This year it was held in the massive parking garage of one of the area's biggest shopping malls. I have never seen so many books in one place. Admission was charged on Friday and an auction was held. Apparently the highlight was a rare signed copy of Hemingway's A Farewell To Arms. I was unable to attend Friday, but I swung by on both Saturday and Sunday. I was looking to fill in some holes in my collections, which meant that I was searching tables and tables and tables of hardbacks and paperbacks. What it made me realize, is that an author is fighting incredible odds to stand out amid the sea of titles out there. If I was having trouble finding Tom Clancy's The Bear And The Dragon, how on earth is a beginning novelist supposed to stand out in that same paper ocean? Anyway, back to the Fair. After hours of browsing I managed to find a stash of titles that more than doubled my massively huge to be read pile which still includes a number of titles that I got from last year's Bouchercon. What piqued my fancy? Well, I managed to fill in my Tom Clancy, Michael Crichton, John Sanford and Patricia Cornwell quite nicely. In addition, I managed to find some novels from authors I know personally, like John Gilstrap from The Kill Zone blog, Jan Burke (autographed), Tess Gerritsen and Barb D'Amato. I also picked up some fine St. Louis authors, like Ridley Pearson, Bobbi Smith, Jo Heistand, Eileen Dreyer and even picked up an autographed copy of SWF Seeks Same by John Lutz which became the movie Singe White Female. I found a 1st edition of Stephen King's Bag Of Bones. I also picked up some romance books for my lovely wife and some light mysteries for my youngest daughter. And the amazing thing is... I spent less than $20. Yep. Today was half price day. Paperbacks were a whopping $.50 and most hardbacks were $1. Oh, I almost forgot. I picked up a 30 year old illustrated book called Play Better Golf by Jack Nicklaus. Then I picked up a 1955 copy of Golf With The Masters. Lastly, I found a 1946 copy of How To Play Golf by Sam Snead. All three of these beauties will be proudly displayed in my den. I lugged all my treasures to my car and began thinking about the future of publishing. As I said, all the proceeds went to worthwhile charities in the St. Louis area, but when publishing goes mostly digital... You noticed I said when, not if... What will become of book fairs? So, if you happened to find yourself in a monster book fair, what would you search for?